The East Kilbride Community Trust were proud to take pride of place on Ruairdhs’s training gear as part of their sponsorship of this fine young man. We continue to wash him all the best in all his future endeavours. He is a born and bred EK talent, a young athlete who gives the youths of the town a local face to recognise to inspire too. 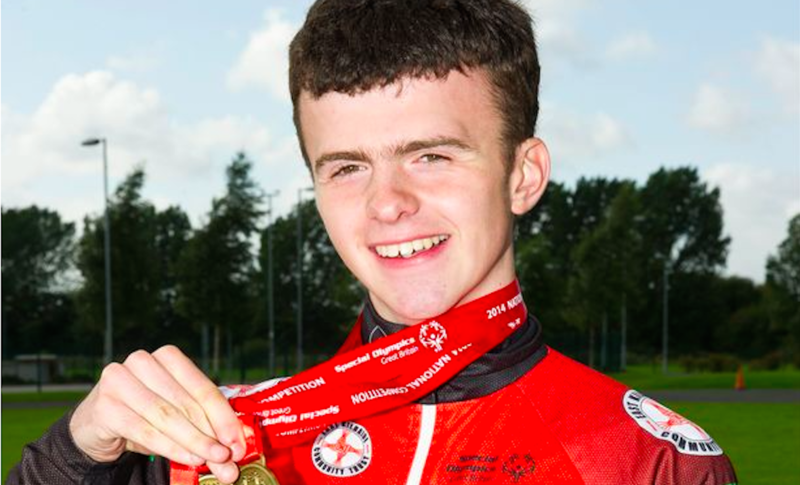 LINDSAYFIELD cyclist Ruairidh Brown geared up for the Special Olympics World Games in Los Angeles with a gold medal treble at the Great Britain National Competition last week. The 16-year-old will head to the States at the end of this month for the prestigious event at the Olympic Coliseum, home to the 1982 Summer Olympics. And his preparations couldn’t have gone any better after a hat-trick of victories in Manchester. The competition at the Tameside Cycle Circuit is the only one where Special Olympics cyclists from all over Great Britain and the Isle of Man come together annually for a weekend of racing. 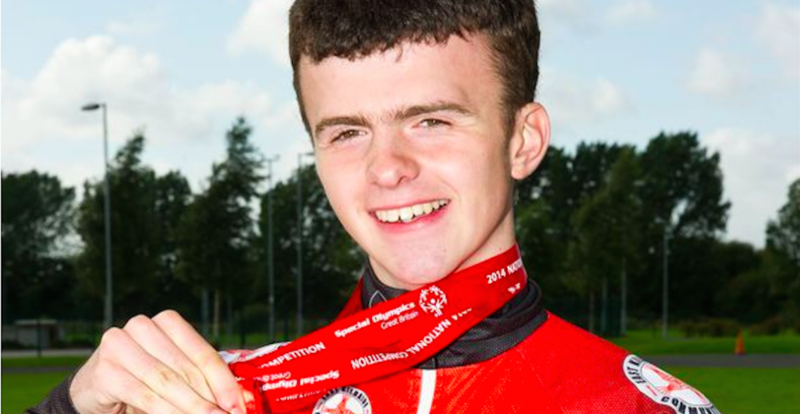 The Special Olympics organisation provide a year-round sports training and competition programme for all people with intellectual disabilities and Ruairidh was entered into the main races, the 15km and 25 km road races and the 10 km Time Trial, ensuring he was racing over the same distances he will compete at in Los Angeles. First up was the 10km Time Trial, an individual race against the clock, which Ruairidh finds difficult as it requires a great degree of concentration. This year he excelled himself and posted a time of 16 minutes and 30 seconds – a full 40 seconds faster than last year and 12 seconds ahead of his nearest rival. In the longer distance road races against a small field of five riders, Ruairidh rode a more tactical race in tricky conditions and in both cases saved some energy for the final lap sprint. In the 15 km road race he took a clear win but in the 25 km race he went head to head with another rider in the final 500m. Ruairidh was leading into the final bend when his competitor took a risky inside line but Ruairidh didn’t panic, held his position and sprinted past to win by a matter of centimetres to complete a clean sweep of wins for the weekend. “It was really hard because it was so cold and windy,” said Ruairidh. “I really wanted to go for it in the Time Trial and I’m happy with my time. The Opening Ceremony for the World Games is on July 25 and will feature performances from Stevie Wonder, Avril Lavigne and Nicole Scherzinger. Ruairidh added: “I can’t wait to go to LA,it’s going to be amazing.